Authorities have completed the accident investigation for the Yarnell Hill fire. The report says the fire's extreme speed prevented the crew from reaching the safety zone. 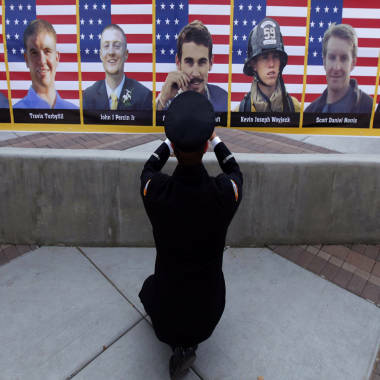 A three-month investigation into the June deaths of 19 firefighters killed while battling an Arizona blaze cites poor communication between the men and support staff, and reveals that an airtanker carrying flame retardant was hovering overhead as the men died. Surviving Hotshot crew member Brendan McDonough walks back to his seat after speaking at a memorial service for the fallen members of the Granite Mountain Hotshots, in Prescott Valley, Ariz., on July 9, 2013. The Arizona State Forestry Division presented the roughly 120-page report to the men's families ahead of a news conference Saturday morning in Prescott. The fire caused little immediate concern because of its remote location and small size when it began June 28. But the blaze quickly grew into an inferno, burning swiftly across pine, juniper and scrub oak and through an area that hadn't experienced a significant wildfire in nearly 50 years. 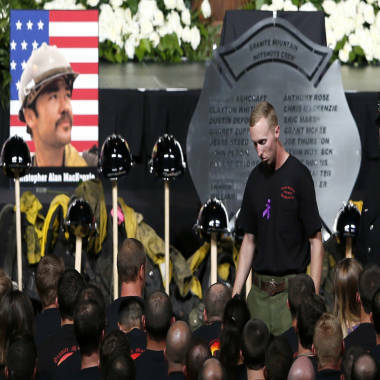 Nineteen firefighters - all members of an elite response team - were killed battling a fast-moving wildfire in Arizona, marking the deadliest single incident for firefighters since the Sept. 11, 2001 attacks. No other wildfire had claimed the lives of more firefighters in 80 years, and it was the deadliest single day for fire crews since the terror attacks of Sept. 11, 2001. The Granite Mountain team was unique among the nation's roughly 110 Hotshot crews as the first and only such unit attached to a municipal fire department. The report said the firefighters didn't anticipate danger when they left the relative safety of a ridge top and dropped down into a bowl surrounded by mountains on three sides, despite warnings of the erratically changing weather that whipped the blaze into an unpredictable inferno. At one point, officials asked for half of the available western U.S. heavy air tanker fleet — six planes — to try to control the blaze. Five weren't deployed because of the limited number in the nation's aerial firefighting fleet and the dangerous weather conditions at the time. One plane was heading to Arizona from California but engine problems forced it to turn back. Forestry officials have said that even if the planes had been available, winds were so strong they couldn't have been used to save the firefighters' lives. "No matter what the report says, it won't bring him back," Colleen Turbyfill said of her son, Travis. "I miss him, and it's unbearable pain. It doesn't go away. Sometimes I can't breathe, but this report isn't going to help that one way or another."